When do you believe learning begins? You are taking a prenatal vitamin to enrich your child’s earliest physical development. Well, your child’s brain development begins during these prenatal months, too! Now is the time to learn about BabyPlus. The BabyPlus Prenatal Education System is a set of sound lessons that are played to the prenatal child. This patented approach enhances learning ability. As your baby begins to recognize the difference between the rhythmic sounds of BabyPlus and the similar natural rhythms of the mother’s heartbeat, learning begins. BabyPlus is a series of 16 scientifically designed sounds that resemble a mothers heartbeat. The rhythm of the sounds increases incrementally as the pregnancy progresses. The BabyPlus sonic pattern introduces your child to a sequential learning process, built upon the natural rhythms of their own environment. The BabyPlus lessons are designed to be played for 1 hour twice a day. For optimal benefits, start using BabyPlus anytime between 18-32 weeks of pregnancy. This "auditory exercise" strengthens learning ability during the developmental period when the advantages will be most significant for a child. 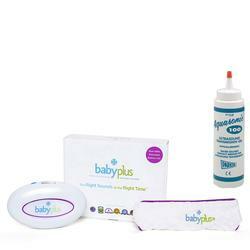 BabyPlus is the first educational tool designed for prenatal use that has been proven effective. BabyPlus children have an intellectual, developmental, creative, and emotional advantage from the time they are born. Your baby can very clearly hear these patterns. She/he learns to discriminate between the sound coming from the mother and those from BabyPlus. In other words, learning has begun. Your baby accelerates the rate at which he or she compares and contrasts information. This process builds your babys memory for greater capacity and function throughout life. BabyPlus is based on more than 20 years of scientific research. Baby Plus prenatal curriculum introduces your developing baby to learning in the only true language of the prenatal environment, the maternal heartbeat. The spoken word is too difficult for the developing child to understand and music is too complex. However, scientifically conducted studies show that the prenatal child recognizes the maternal heartbeat and can learn to differentiate progressively more complex patterns of that sound. Since 1989, more than 100,000 parents worldwide have given their children the BabyPlus advantage. BabyPlus was developed by Dr. Brent Logan, a developmental psychologist who directs the Prenatal Institute, Seattle, WA. Dr. Logan’s 25 years of research have demonstrated that prenatal stimulation using heartbeat-based sounds of increasing complexity is the most effective means of communicating with your developing child. BabyPlus is the only system of its kind to have been granted a patent from the United States Patent Office. Patent No. US 6,494,719. Among obstetricians, pediatricians, scientists, and educators, there is tremendous interest in the impact of prenatal enrichment. BabyPlus is the irrefutable leader in this field. BabyPlus is based on solid scientific theory, is supported by extensive research, and its value is definitively proven by followup studies. BabyPlus is not a toy — it is a profound educational tool, and the first step in your childs lifelong cognitive development.